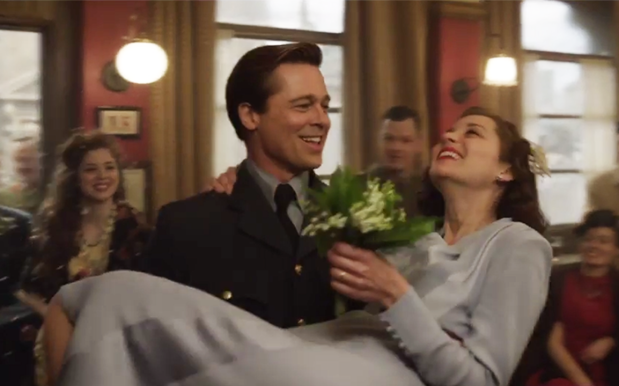 The new Brad Pitt and Marion Cotillard film called 'Allied' has just dropped on the same day as Angelina Jolie's divorce announcement. You know, THAT one. Oh, you missed it? Read more HERE. Anyways, the new Pitt/Cotillard movie is about an intelligence officer Max Vatan (Pitt), who encounters French Resistance fighter Marianne Beausejour (Cotillard) on a deadly mission behind enemy lines in North Africa, in 1942. With tabloids reporting unsubstantiated claims that Brad and Marion had something happening off set as well as on, the timing of this trailer release is rather clever, don't you think..? These reports that Angelina's breaking point was a private eye uncovering Pitt allegedly having an affair with Cotillard in real life. "She hired a private eye because she felt that he was fooling around with her on the set, and it turns out, he was. And that was the final straw," a source said. In 2005 Angelina was accused of being the catalyst in the much talked about breakup of Brad with his then wife Jennifer Aniston. Ange and Brad were accused of having an affair during filming of 'Mr. & Mrs. Smith'. In 2006, Angelina and Brad confirmed they were in a serious relationship, and got married in 2014.